Poor MOTH (man-o-the-house). I had bugged him for two (maybe 3?) weeks to bring down my grandmother's nativity set. Then one morning, his usual day off, he had to go in to work at 6:00 a.m. I got up and saw he'd taken time to crawl up in the cold attic and bring down the box. 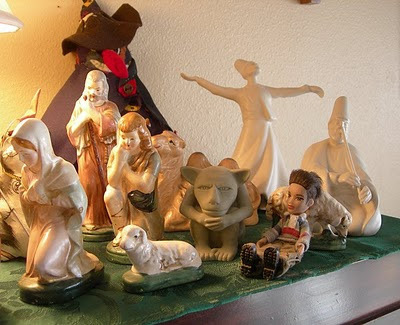 I began to set up the familiar characters -- Jesu, Isa, Jesus, his parents, the barnyard animals -- atop our lawyer's cabinet. I decided to leave the Japanese lamp, with the woman who looks like a Persian angel riding an elephant, behind the scene, to add lighting at night. Well, that's when one thing led to another. 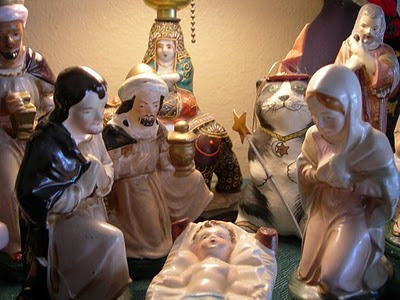 I pulled out a couple of whirling dervishes from the case below, then out came the Navajo doll weaving a blanket, to add a bit of local homage to the sweet baby Jesus. Of course, the magical cat and rabbit ornaments that I usually put on the tree seemed the perfect scale, and, well, once I got started I couldn't seem to stop. 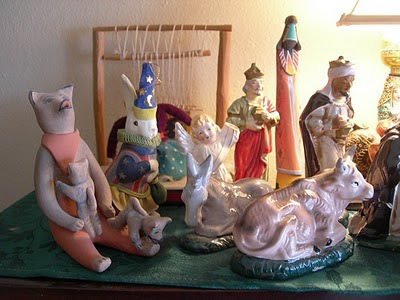 Having no shortage of global odds and ends laying around within arm's reach, our usual set expanded to include Hopi kachina doll, a coyote storyteller, an angel amputee I can't bear to throw away, a gargoyle, a big witch doll my kid made in elementary school (actually he says his teacher made most of it, which is a big no-no in the art ed world but we love it just the same), a boy doll we call "Joey's Inner Child," and a little red buddha who's hiding somewhere south of the gargoyle. Hello blog... how things go for you today? Aren't you lonely since our author disappeared? Well look here -- is that a teardrop in the corner of your screen? Nope! I'm baaaack. School's out for a bit and I got a big chunk o' work done this Fall, so I'm ready to party in blogland. Time to dig out my pictures and notes and book reviews I've been saving since September!